The first half of last week’s comics are mostly ones from Comics Kingdom and Creators.com. That’s unusual. GoComics usually far outranks the other sites. Partly for sheer numbers; they have an incredible number of strips, many of them web-only, that Comics Kingdom and Creators.com don’t match. 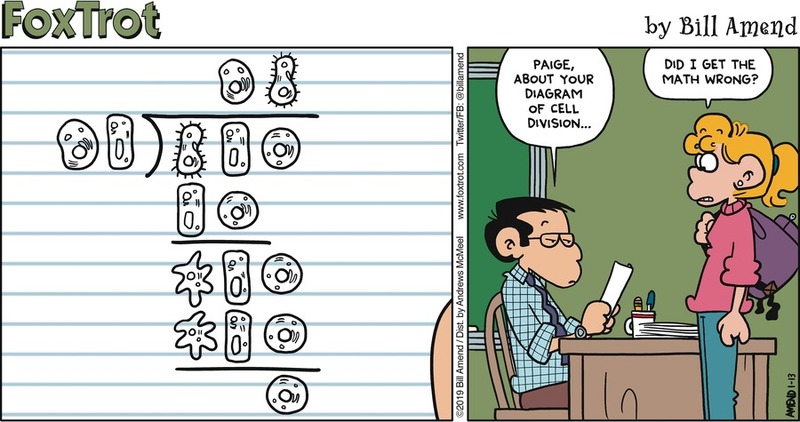 I think the strips on GoComics are more likely to drift into mathematical topics too. But to demonstrate that would take so much effort. Possibly any effort at all. Hm. Bill Holbrook’s On the Fastrack for the 8th of July is premised on topographic maps. These are some of the tools we’ve made to understand three-dimensional objects with a two-dimensional representation. When topographic maps come to the mathematics department we tend to call them “contour maps” or “contour plots”. These are collections of shapes. They might be straight lines. They might be curved. They often form a closed loop. Each of these curves is called a “contour curve” or a “contour line” (even if it’s not straight). Or it’s called an “equipotential curve”, if someone’s being all fancy, or pointing out the link between potential functions and these curves. Bill Holbrook’s On the Fastrack for the 8th of July, 2018. I do like Holbrook’s art here, in evoking a figure standing vertically upon a most horizontal surface. There’s never enough intriguing camera angles in comic strips. Their purpose is in thinking of three-dimensional surfaces. We can represent a three-dimensional surface by putting up some reasonable coordinate system. For the sake of simplicity let’s suppose the “reasonable coordinate system” is the Cartesian one. So every point in space has coordinates named ‘x’, ‘y’, and ‘z’. Pick a value for ‘x’ and ‘y’. There’s at most one ‘z’ that’ll be on the surface. But there might be many sets of values of ‘x’ and ‘y’ together which have that height ‘z’. So what are all the values of ‘x’ and ‘y’ which match the same height ‘z’? Draw the curve, or curves, which match that particular value of ‘z’. Topographical maps are a beloved example of this, to mathematicians, because we imagine everyone understands them. A particular spot on the ground at some given latitude and longitude is some particular height above sea level. OK. Imagine the slice of a hill representing all the spots that are exactly 10 feet above sea level, or whatever. That’s a curve. Possibly several curves, but we just say “a curve” for simplicity. A topographical map will often include more than one curve. Often at regular intervals, say with one set of curves representing 10 feet elevation, another 20 feet, another 30 feet, and so on. Sometimes these curves will be very near one another, where a hill is particularly steep. Sometimes these curves will be far apart, where the ground is nearly level. With experience one can learn to read the lines and their spacing. One can see where extreme values are, and how far away they might be. Topographical maps date back to 1789. These sorts of maps go back farther. In 1701 Edmond Halley, of comet fame, published maps showing magnetic compass variation. He had hopes that the difference between magnetic north and true north would offer a hint at how to find longitude. (The principle is good. But the lines of constant variation are too close to lines of latitude for the method to be practical. And variation changes over time, too.) And that shows how the topographical map idea can be useful to visualize things that aren’t heights. Weather maps include “isobars”, contour lines showing where the atmospheric pressure is a set vale. More advanced ones will include “isotherms”, each line showing a particular temperature. The isobar and isotherm lines can describe the weather and how it can be expected to change soon. This idea, rendering three-dimensional information on a two-dimensional surface, is a powerful one. We can use it to try to visualize four-dimensional objects, by looking at the contour surfaces they would make in three dimensions. We can also do this for five and even more dimensions, by using the same stuff but putting a note that “D = 16” or the like in the corner of our image. And, yes, if Cartesian coordinates aren’t sensible for the problem you can use coordinates that are. If you need a generic name for these contour lines that doesn’t suggest lines or topography or weather or such, try ‘isogonal curves’. Nobody will know what you mean, but you’ll be right. Ted Key’s Hazel for the 9th is a joke about the difficulties in splitting the bill. 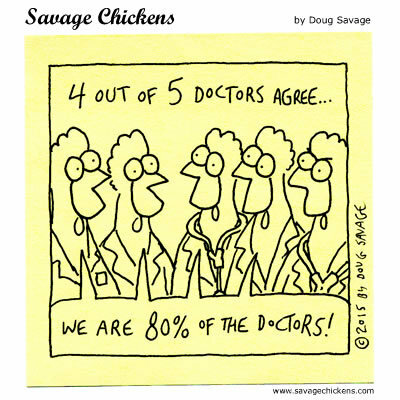 It is archetypical of the sort of arithmetic people know they need to do in the real world. Despite that at least people in presented humor don’t get any better at it. I suppose real-world people don’t either, given some restaurants now list 15 and 20 percent tips on the bill. Well, at least everybody has a calculator on their phone so they can divide evenly. And I concede that, yeah, there isn’t really specifically a joke here. It’s just Hazel being competent, like the last time she showed up here. Mark Anderson’s Andertoons for the 11th is the Mark Anderson’s Andertoons for the week. 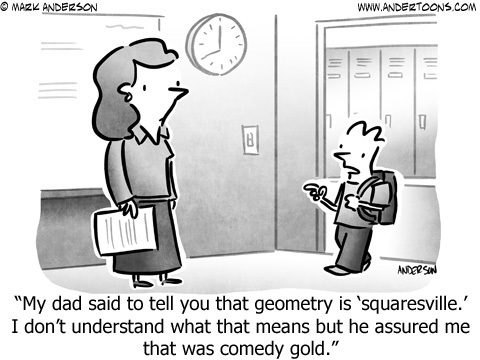 And it’s a bit of geometry wordplay, too. Also about how you can carry a joke over well enough even without understanding it, or the audience understanding it, if it’s delivered right. Rick DeTorie’s One Big Happy for the 11th of July, 2018. GoComics.com has a different strip for the day, as DeTorie publishes the new strips on Creators.com and uses several-years-old reruns on GoComics. 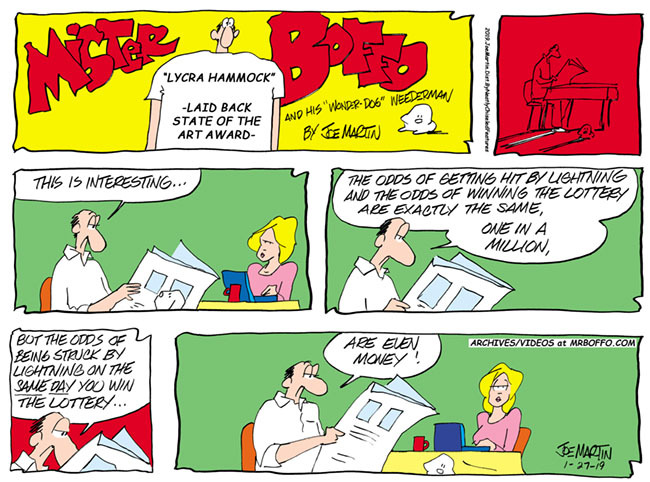 Rick DeTorie’s One Big Happy for the 11th is another strip about arithmetic done in the real world. I’m also amused by Joe’s attempts to distract from how no kid that age has ever not known precisely how much money they have, and how much of it is fairly won. Bill Griffith’s Zippy the Pinhead for the 11th of July, 2018. This is part of a relatively new running sequence, perhaps a spinoff of Griffith’s very long Dingburg obsession, about people who are kind of generically golden-age-of-cartoon characters. Bill Griffith’s Zippy the Pinhead for the 11th is another example of using understanding algebra as a show of intelligence. And it follows that up with undrestanding quantum physics as a show of even greater intelligence. One can ask what’s meant by “understanding” quantum physics. Someday someone might even answer. But it seems likely that the ability to do calculations based on a model has to be part of fully understanding it. I have even more Reading the Comics posts, gathered in reverse chronological order at this link. Other essays with On The Fastrack tagged are at this link. Other Reading the Comics posts that mention Hazel are at this link. Some of the many, many essays mentioning Andertoons are at this link. Posts with mention of One Big Happy , both then-current and then-rerun, are at this link. And other mentions of Zippy the Pinhead are at this link. I have a couple loose rules about these Reading the Comics posts. At least one a week, whether there’s much to talk about or not. Not too many comics in one post, because that’s tiring to read and tiring to write. Trying to write up each day’s comics on the day mitigates that some, but not completely. So I tend to break up a week’s material if I can do, say, two posts of about seven strips each. This year, that’s been necessary; I’ve had a flood of comics on-topic or close enough for me to write about. This past week was a bizarre case. There really weren’t enough strips to break up the workload. It was, in short, a normal week, as strange as that is to see. I don’t know what I’m going to do Thursday. I might have to work. Aaron McGruder’s Boondocks for the 25th of March of March, 2018. Yeah, all right, but I would not want to be the teacher keeping a class of people heckling the student working a story problem on the board from turning abusive. Ted Shearer’s Quincy for the 30th of January, 1979 and rerun the 26th names arithmetic as the homework Quincy’s most worried about. Or would like to put off the most. Harmless enough. 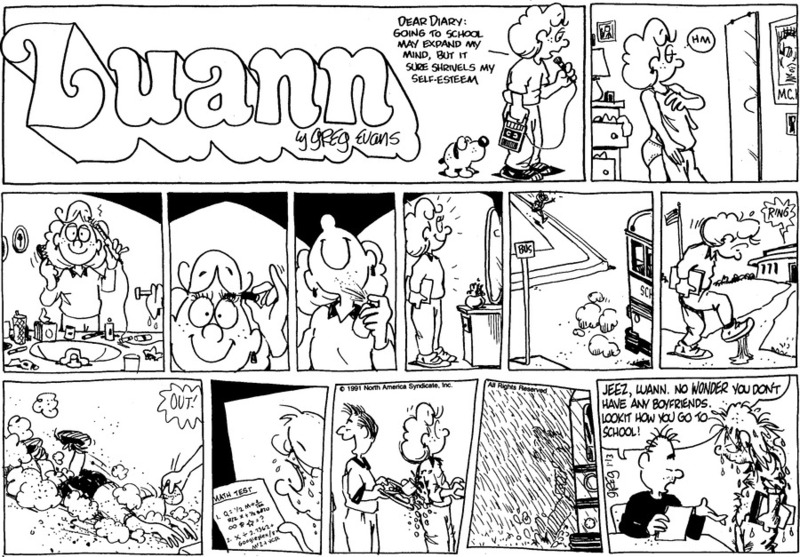 Ted Shearer’s Quincy for the 30th of January, 1979 and rerun the 26th of March, 2018. Because if there’s one thing that improves a teacher’s mood while grading, it’s having to do it while hurried after a night of rotten sleep in an apartment that possibly hasn’t got any heat! Mike Thompson’s Grand Avenue for the 26th is a student-resisting-the-problem joke. A variable like ‘x’ serves a couple of roles. One of them is the name for a number whose value we don’t explicitly know, but which we hope to work out. And that’s the ‘x’ seen here. The other role of ‘x’ is the name for a number whose value we don’t know and don’t particularly care about. Since those are different reasons to use ‘x’ maybe we ought to have different names for the concepts. But we don’t and there’s probably no separating them now. Tony Cochran’s Agnes for the 27th grumbles that mathematics and clairvoyance are poorly taught. Well, everyone who loves mathematics grumbles that the subject is poorly taught. I don’t know what the clairvoyants think but I’ll bet the same. 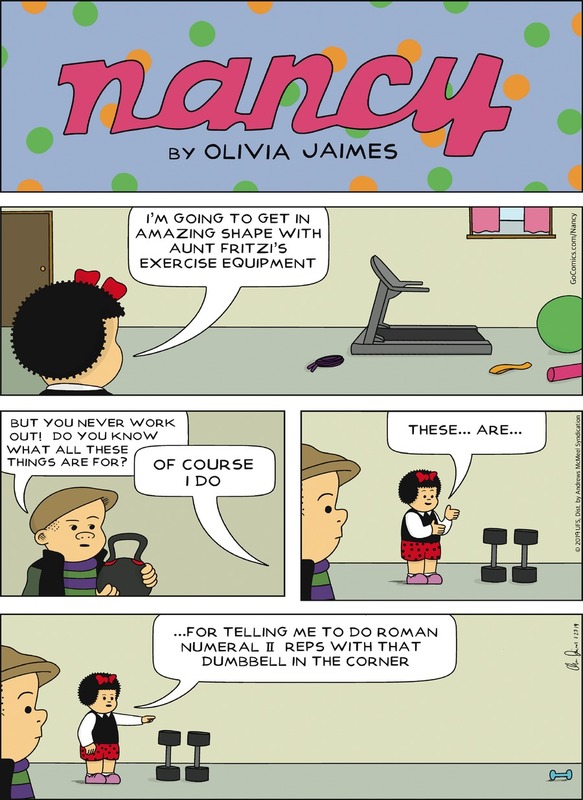 Tony Cochran’s Agnes for the 27th of March, 2018. In fairness, once students have got a little clairvoyant it becomes crazy hard to do assessment testing. Mark Pett’s Lucky Cow rerun for the 28th is about sudoku. As with any puzzle the challenge is having rules that are restrictive enough to be interesting. This is also true of any mathematical field, though. You want ideas that imply a lot of things are true, but that also imply enough interesting plausible things are not true. Mark Pett’s Lucky Cow rerun for the 28th of March, 2018. It’s not that I’m not amused by the strip. But the mechanism of setting up the premise, developing it, and delivering the punch line really stands out sorely here. It’s hard to believe in someone saying Leticia’s line the third panel. Rick DeTorie’s One Big Happy rerun for the 30th has Ruthie working on a story problem. One with loose change, which seems to turn up a lot in story problems. I never think of antes for some reason. Rick DeTorie’s One Big Happy rerun for the 30th of March, 2018. Grandpa plays a lot of card games with Ruthie maybe people should know. Stephen Beals’s Adult Children for the 31st depicts mathematics as the stuff of nightmares. (Although it’s not clear to me this is meant to recount a nightmare. Reads like it, anyway.) Calculus, too, which is an interesting choice. Calculus seems to be a breaking point for many people. A lot of people even who were good at algebra or trigonometry find all this talk about differentials and integrals and limits won’t cohere into understanding. Isaac Asimov wrote about this several times, and the sad realization that for as much as he loved mathematics there were big important parts of it that he could not comprehend. Stephen Beals’s Adult Children for the 31st of March, 2018. Spivak’s Calculus is one of the standard textbooks for intro students, by the way, although my own education was on James (not that James) Stewart. Spivak’s also noted for a well-regarded guide to TeX, which incidentally used a set of gender-neutral third-person singular pronouns (e[y]/em/eir) that some online communities embraced. It was a normal-paced week at Comic Strip Master Command. It was also one of those weeks that didn’t have anything from Comics Kingdom or Creators.Com. So I’m afraid you’ll all just have to click the links for strips you want to actually see. Sorry. Bill Amend’s FoxTrot for the 12th has Jason and Marcus creating “mathic novels”. They, being a couple of mathematically-gifted smart people, credit mathematics knowledge with smartness. A “chiliagon” is a thousand-sided regular polygon that’s mostly of philosophical interest. A regular polygon with a thousand equal sides and a thousand equal angles looks like a circle. There’s really no way to draw one so that the human eye could see the whole figure and tell it apart from a circle. But if you can understand the idea of a regular polygon it seems like you can imagine a chilagon and see how that’s not a circle. So there’s some really easy geometry things that can’t be visualized, or at least not truly visualized, and just have to be reasoned with. Rick Detorie’s One Big Happy for the 12th is a story-problem-subversion joke. The joke’s good enough as it is, but the supposition of the problem is that the driving does cover fifty miles in an hour. This may not be the speed the car travels at the whole time of the problem. Mister Green is maybe speeding to make up for all the time spent travelling slower. Brandon Sheffield and Dami Lee’s Hot Comics for Cool People for the 13th uses a blackboard full of equations to represent the deep thinking being done on a silly subject. Shannon Wheeler’s Too Much Coffee Man for the 15th also uses a blackboard full of equations to represent the deep thinking being done on a less silly subject. It’s a really good-looking blackboard full of equations, by the way. Beyond the appearance of our old friend E = mc2 there’s a lot of stuff that looks like legitimate quantum mechanics symbols there. They’re at least not obvious nonsense, as best I can tell without the ability to zoom the image in. I wonder if Wheeler didn’t find a textbook and use some problems from it for the feeling of authenticity. Samson’s Dark Side of the Horse for the 16th is a story-problem subversion joke. There’s some mathematics symbols on The Utilitarian’s costume. The capital U on his face is probably too obvious to need explanation. The on his chest relies on some mathematical convention. For maybe a half-millennium now mathematicians have been using the capital sigma to mean “take a sum of things”. The things are whatever the expression after that symbol is. Usually, the Sigma will have something below and above which carries meaning. It says what the index is for the thing after the symbol, and what the bounds of the index are. Here, it’s not set. This is common enough, though, if this is understood from context. Or if it’s obvious. The small ‘u’ to the right suggests the utility of whatever’s thought about. (“Utility” being the name for the thing measured and maximized; it might be happiness, it might be general well-being, it might be the number of people alive.) So the symbols would suggest “take the sum of all the relevant utilities”. Which is the calculation that would be done in this case. On reflection, that Saturday Morning Breakfast Cereal I was thinking about was not mathematically-inclined enough to be worth including here. Helping make my mind up on that was that I had enough other comic strips to discuss here that I didn’t need to pad my essay. Yes, on a slow week I let even more marginal stuff in. Here’s the comic I don’t figure to talk about. Enjoy! Jack Pullan’s Boomerangs rerun for the 16th is another strip built around the “algebra is useless in real life” notion. I’m too busy noticing Mom in the first panel saying “what are you doing play [sic] video games?” to respond. Ruben Bolling’s Super-Fun-Pak Comix excerpt for the 16th is marginal, yeah, but fun. Numeric coincidence and numerology can sneak into compulsions with terrible ease. I can believe easily the need to make the number of steps divisible by some favored number. Rich Powell’s Wide Open for the 16th is a caveman science joke, and it does rely on a chalkboard full of algebra for flavor. The symbols come tantalizingly close to meaningful. The amount of kinetic energy, K or KE, of a particle of mass m moving at speed v is indeed . Both 16 and 32 turn up often in the physics of falling bodies, at least if we’re using feet to measure. turns up in physics too. It comes from the acceleration of a mass on a spring. But an equation of the same shape turns up whenever you describe things that go through tiny wobbles around the normal value. So the blackboard is gibberish, but it’s a higher grade of gibberish than usual. Rick Detorie’s One Big Happy rerun for the 17th is a resisting-the-word-problem joke, made fresher by setting it in little Ruthie’s playing at school. T Lewis and Michael Fry’s Over The Hedge for the 18th mentions the three-body problem. As Verne the turtle says, it’s a problem from physics. The way two objects — sun and planet, planet and moon, pair of planets, whatever — orbit each other if they’re the only things in the universe is easy. You can describe it all perfectly and without using more than freshman physics majors know. Introduce a third body, though, and we don’t know anymore. Chaos can happen. Emphasis on can. There’s no good way to solve the “general” three-body problem, the one where the star and planets can have any sizes and any starting positions and any starting speeds. We can do well for special cases, though. If you have a sun, a planet, and a satellite — each body negligible compared to the other — we can predict orbits perfectly well. If the bodies have to stay in one plane of motion, instead of moving in three-dimensional space, we can do pretty well. If we know two of the bodies orbit each other tightly and the third is way off in the middle of nowhere we can do pretty well. Dave Whamond’s Reality Check for the 18th is your basic mathematics-illiteracy joke, done well enough. 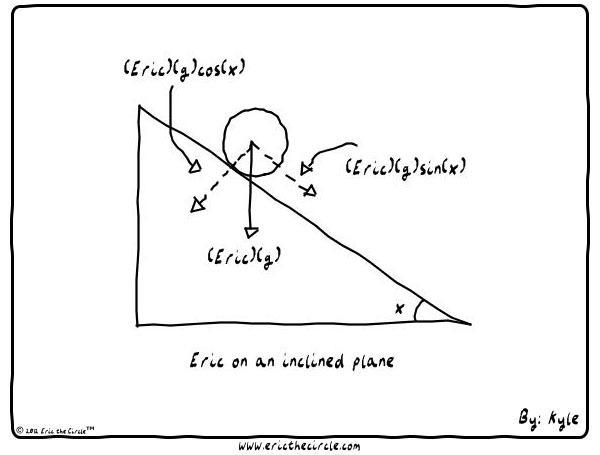 And now I can close out last week’s mathematically-themed comic strips. Two of them are even about counting, which is enough for me to make that the name of this set. John Allen’s Nest Heads for the 2nd mentions a probability and statistics class and something it’s supposed to be good for. I would agree that probability and statistics are probably (I can’t find a better way to write this) the most practically useful mathematics one can learn. At least once you’re past arithmetic. They’re practical by birth; humans began studying them because they offer guidance in uncertain situations. And one can use many of their tools without needing more than arithmetic. I’m not so staunchly anti-lottery as many mathematics people are. I’ll admit I play it myself, when the jackpot is large enough. When the expectation value of the prize gets to be positive, it’s harder to rationalize not playing. This happens only once or twice a year, but it’s fun to watch and see when it happens. I grant it’s a foolish way to use two dollars (two tickets are my limit), but you know? My budget is not so tight I can’t spend four dollars foolishly a year. Besides, I don’t insist on winning one of those half-billion-dollar prizes. I imagine I’d be satisfied if I brought in a mere $10,000. Rick Detorie’s One Big Happy for the 3rd of February, 2017. A ‘gazillion’ is actually a surprisingly low number, hovering as it does somewhere around 212. Fun fact! Rick Detorie’s One Big Happy for the 3rd continues my previous essay’s bit of incompetence at basic mathematics, here, counting. But working out that her age is between 22 an a gazillion may be worth doing. 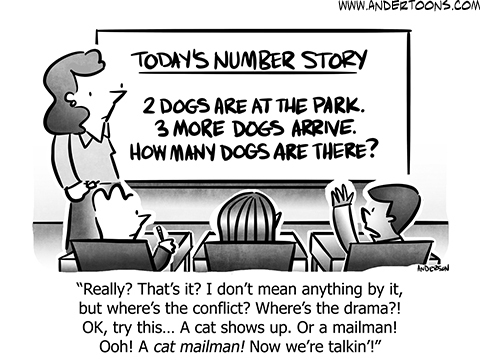 It’s a common mathematical challenge to find a correct number starting from little information about it. Usually we find it by locating bounds: the number must be larger than this and smaller than that. And then get the bounds closer together. Stop when they’re close enough for our needs, if we’re numerical mathematicians. Stop when the bounds are equal to each other, if we’re analytic mathematicians. That can take a lot of work. Many problems in number theory amount to “improve our estimate of the lowest (or highest) number for which this is true”. We have to start somewhere. Samson’s Dark Side of the Horse for the 3rd is a counting-sheep joke and I was amused that the counting went so awry here. On looking over the strip again for this essay, though, I realize I read it wrong. It’s the fences that are getting counted, not the sheep. Well, it’s a cute little sheep having the same problems counting that Horace has. We don’t tend to do well counting more than around seven things at a glance. We can get a bit farther if we can group things together and spot that, say, we have four groups of four fences each. That works and it’s legitimate; we’re counting and we get the right count out of it. But it does feel like we’re doing something different from how we count, say, three things at a glance. Mick Mastroianni and Mason Mastroianni Dogs of C Kennel for the 3rd is about the world’s favorite piece of statistical mechanics, entropy. There’s room for quibbling about what exactly we mean by thermodynamics saying all matter is slowly breaking down. But the gist is fair enough. It’s still mysterious, though. To say that the disorder of things is always increasing forces us to think about what we mean by disorder. It’s easy to think we have an idea what we mean by it. It’s hard to make that a completely satisfying definition. In this way it’s much like randomness, which is another idea often treated as the same as disorder. 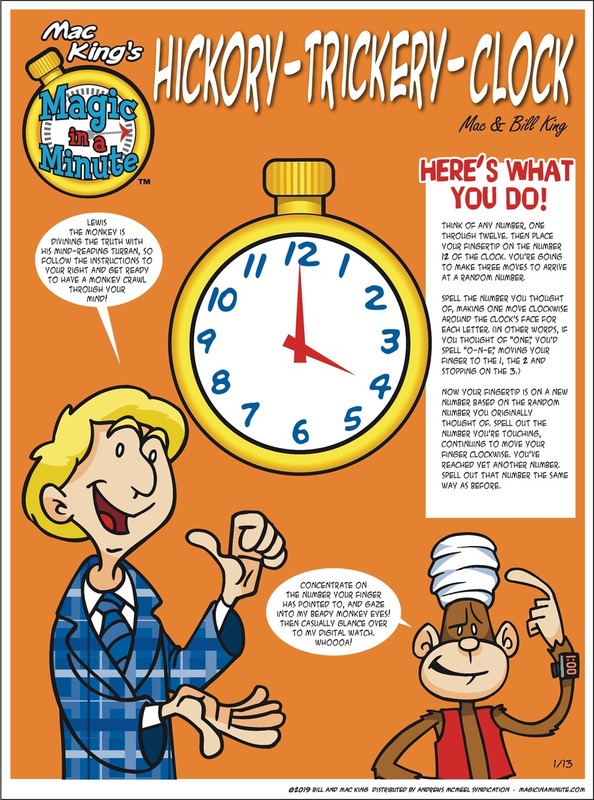 Bill Amend’s FoxTrot Classics for the 3rd reprinted the comic from the 10th of February, 2006. Mathematics teachers always want to see how you get your answers. Why? … Well, there are different categories of mistakes someone can make. One can set out trying to solve the wrong problem. One can set out trying to solve the right problem in a wrong way. One can set out solving the right problem in the right way and get lost somewhere in the process. Or one can be doing just fine and somewhere along the line change an addition to a subtraction and get what looks like the wrong answer. Each of these is a different kind of mistake. Knowing what kinds of mistakes people make is key to helping them not make these mistakes. They can get on to making more exciting mistakes.